Marguerite of Valois is one of those rare princesses who didn’t marry until late in life. She was thirty-six when her wedding finally took place. This was partly due to the fact that her father and brother loved her very much and couldn’t bring themselves to be separated from her and partly due to a long search for the right man to marry a woman of such preeminent status. She was the longest lived of all of King François I’s children and there are many portraits of her. 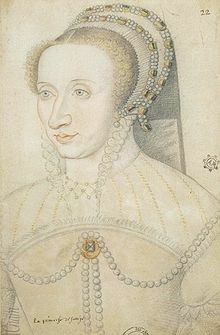 Marguerite was born on June 5, 1523 in the Château of Saint-Germain-en-Laye in France. She was the youngest daughter and child of King François I and Queen Claude de Valois. Her mother died a year later so Marguerite and her sister Madeleine grew up under the care of their father’s sister Marguerite d’Angoulême. Marguerite was very close to her aunt and she instilled in her an interest in humanistic teachings and the Protestant Reformation. After the death of Marguerite’s grandmother, Louise of Savoy, in September 1531, her father’s mistress Anne de Pisseleu, Duchess D’Etampes took over the duties of raising Marguerite and her sister. In 1529, with the brokering of the Peace of Cambrai, Marguerite’s marriage to Maximilian of Austria, nephew of the Holy Roman Emperor was a part of the negotiations. But war broke out again between the Habsburgs and France and this marriage was abandoned. In 1533, Catherine de’ Medici arrived at the French court to marry Marguerite’s brother Henri. It was the beginning of a long friendship between the two women. They spent many hours together and long after Marguerite left the French court, she and Catherine exchanged letters. Marguerite lived in the Louvre during her father and her brother’s reign. 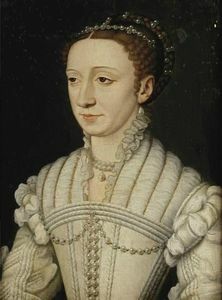 In the courtyard of the Louvre or the Château of Fontainebleau, Marguerite would attend salons that included her aunt Marguerite d’Angoulême, her sister Madeleine, Queen Eleanor, second wife of her father and her sister-in-law Catherine de’ Medici along with many of their ladies-in-waiting. During these meetings, the women would study Latin and Greek. Marguerite herself spoke excellent French and Italian. These women were patrons and supporters of several famous poets of the day and would hold readings of their poems along with accompaniment of music by the composer Antoine Bertrand. Many of these poets wrote about Marguerite, saying she was wise, virtuous, and full of grace and sweetness. These poets were sad to see her leave the French court when she did eventually marry. In 1538, Marguerite’s father was once again on good terms with the Holy Roman Emperor Charles V and brokered a betrothal for her with Charles’ son Philip, the future King Philip II of Spain. On July 14 of that year, a face-to-face meeting was held at Aigues-Mortes between Charles V and François I. Marguerite attended the meeting in the entourage of Queen Eleanor. However, the political tide soon turned and François and Charles were at odds once again, the agreement was dropped and Marguerite’s marriage never materialized. There was more discussion in 1545 of Marguerite marrying Philip of Spain. Once again, the talks fell through. During this time there were some family struggles and feuds between Marguerite’s father and her brothers Henri and Charles. Marguerite supported Charles in these feuds until he died on September 9, 1545. In March of 1547, Marguerite’s father was very ill. She visited him on his deathbed and held his hand. He was so overcome with emotion, he turned to the side and was unable to speak. He urged her brother Henri to take care of his sister and to marry her to a man befitting of her status. King François died on March 31, 1547. The new king Henri II sent his wife Catherine de’ Medici and Marguerite to the convent of Poissy to inform Queen Eleanor of her husband’s death. When Marguerite saw a pale Eleanor in a black mourning gown, she had two fainting fits. Marguerite led a cortege of ladies in the procession behind Queen Catherine as she was crowned in Saint-Denis on June 10, 1549. Marguerite was very proud of her status as a daughter of France and wanted to marry a king at best and a sovereign at the very least. On April 29, 1550, her brother ennobled her with the title of Duchess of Berry, a title she held for the rest of her life. The title also gave her material and financial independence. Just before her thirty-sixth birthday, King Henri arranged a marriage for Marguerite as part of the terms in the Treaty of Cateau-Cambrésis between Spain and France which was signed on April 3, 1559. The husband selected for her was Emmanuel Philibert, Duke of Savoy and Prince of Piedmont. Marguerite was to keep her duchy of Berry and its revenues and Henri offered a dowry of three hundred thousand crowns, payable in three installments. Duke Emmanuel also received an income of thirty thousand crowns a year and the territories of Bresse, Bugey and Valromey. At this age, Marguerite was described as being a spinster but of excellent breeding and having a lively intellect. The Duke arrived in France with one hundred and fifty gentlemen dressed in red satin doublets, crimson shoes and cloaks of black velvet embroidered with gold lace. The official marriage contract was signed on June 27 and on the next day, a round of celebratory tournaments began. It would be the last time tournaments were held at the court of France. On June 30, King Henri was tilting in the lists and boasted he wanted to make another run. Queen Catherine tried to talk him out of it but he insisted. He took one last run against the Count of Montgomery whose lance slipped. It struck Henri in his helmet at a point just beneath the visor. The lance entered his right eye and penetrated his brain as the lance point shattered into pieces. The king suffered a slow and painful death. 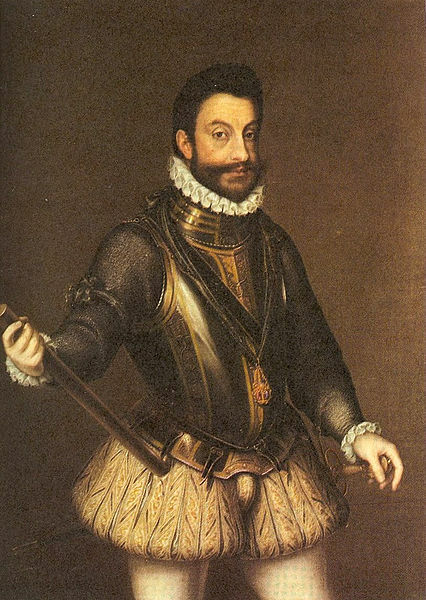 He was still conscious and was fearful the Duke of Savoy would avoid marrying his sister. He ordered the wedding take place immediately. 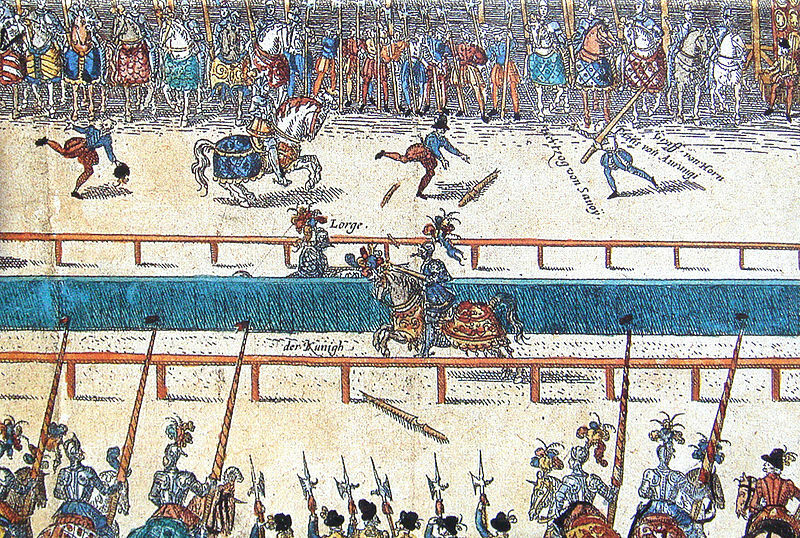 King Henri II of France is injured in a jousting tournament celebrating Marguerite’s marriage. The marriage ceremony was to be celebrated in the Cathedral of Notre Dame. Instead it took place in a solemn and subdued ceremony at midnight on July 9 in the small church of Saint Paul’s near Tournelles Palace where Henry lay dying. Emmanuel Philibert had given Henri the horse he had ridden in that last tournament. He attended the bedside of the dying king and personally summoned King Philip II of Spain’s private physician. Marguerite comforted Catherine de’ Medici through the days Henri was dying and also gave her level-headed advice. Henri died on July 10. After her wedding, as she mourned the death of her brother, Marguerite’s new husband departed to reconquer lost territory. Marguerite stayed in Paris to attend to her sister-in-law and her nephews. Her move to Savoy was delayed several times until she finally left to join her husband in Nice on November 18. From there they moved on to settle in Savoy and Piedmont. Marguerite of was very concerned about the discord in her home country during the French Wars of Religion. She was sympathetic to the Huguenots and gave her sister-in-law level headed advice, urging her to observe clemency. She was known to support French Protestants while in France and played hostess to those who left France and came to Savoy. She secretly gave aid to her former lady-in-waiting Jacqueline d’Entremont, the widow of Admiral de Coligny who was killed on August 24, 1572 during the Saint Bartholomew’s Day massacre of Protestants in France. She also welcomed to Turin the Huguenot writer Jacques Grevin who later became her personal physician. The Venetian ambassador to Turin conducted an inquiry into whether Marguerite had abandoned her Catholic faith for Protestantism. He found she had not abjured Catholicism and that she heard mass every morning. But her protection to Huguenots was disconcerting and put her under suspicion. She was instrumental in soliciting her husband’s support for the Waldensian’s, a reformed Protestant minority who lived within his territory. The Cavour Treaty of June, 1561, allowed them to freely worship in certain areas of the Piedmont. She acted as intermediary between Catherine de’ Medici as Regent of France and her husband. She participated in the negotiations regarding the return of the last strongholds held by France in Italy. She was very active in the negotiation of a treaty that removed the cities of Turin, Chivas, Chieri and Savigliano from French rule and put them under the House of Savoy. In another treaty she participated in dated December 14, 1574 after her death, the French evacuated the fortress of Pinerolo, Savigliano and the Perugia Valley. Turin was a French stronghold since the Italian campaign of King François I in 1536 and was part of Marguerite’s dowry. It was to be turned over to the Duke of Savoy on the condition that Marguerite give birth to a male heir. This she did with the birth of her son Charles Emmanuel in 1562. The French then evacuated Turin and the Duke moved the capital of Savoy from Chambery to Turin. 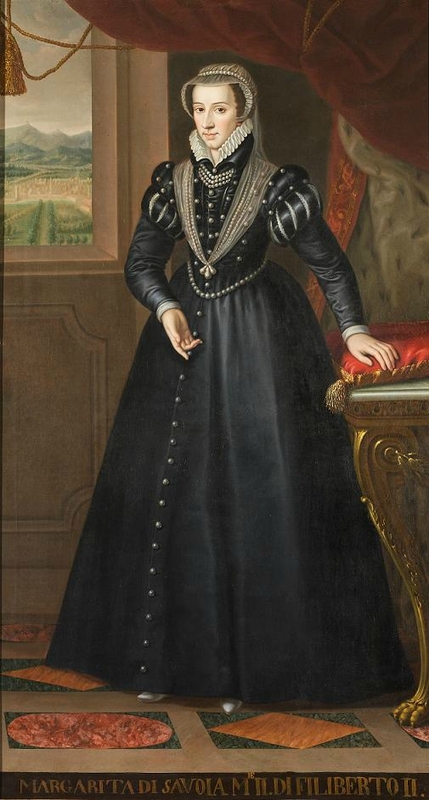 When her nephew King Henri III returned from Poland to France in 1574 to claim the French crown, he stopped in Turin to visit his aunt Marguerite. As a gift in return for her warm welcome, he gave her three fortress-cities that lay in his own kingdom just outside the borders of Savoy; Pinerolo, Savigliano, and Peruza. Margaret died on September 14, 1574 at the age of fifty-one. Her death was greatly mourned as she was beloved by the Savoy people. She was buried in the Abbey of Hautecombe, the mausoleum of the House of Savoy. Her grave was desecrated during the French Revolution but her tomb was later restored. Her husband was buried in the Cathedral of Saint Giovanni Battista in Turin. Great story. Thank you for sharing. She accomplished a lot by the time of her death, only 51! That is my age. I’m not so familiar with this period, Susan, so found your post fascinating. A clever, competent and principled woman of history! The article is most interesting. Some facts are new to me. I thought the tournament in which Henry II was injured was held in honor of his daughter Isabel’s engagement to Philip II of Spain. Margaret’s name is not mentioned in the journals I have consulted as being a friend of Catherine Medici’s??? Did Catherine of Medici have any friends in France? Pingback: Marguerite of Valois, Duchess of Savoy and Berry « The Freelance History Writer | "The Kitten That Roars"